Canvey born Richard Onslow could not believe that a town such as Southend did not have an independent record shop. After working with the biggest names in music, such as the White Stripes and Katy Perry, during stints acting as s PR for major record labels EMI and XL Records he decided to rectify the situation. 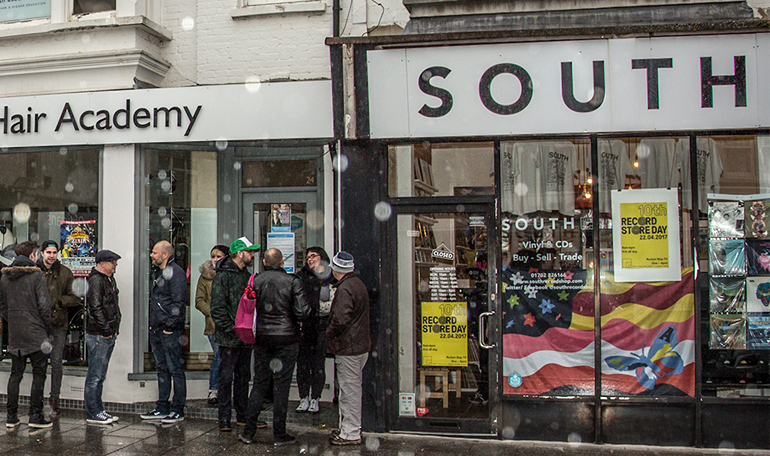 With an impressive array of collectable vinyl, South Record Shop has a welcoming atmosphere and if you ask nicely Richard may he even make you a cup of liquorice tea. Richard has established the shop as a musical hub and a meeting place for music fans in the town. One feature of the shop you can’t but help notice is the safe located to the left of the counter. It offers no worthwhile purpose other than to display leaflets on. It was built into the shop so when Richard acquired the shop the safe came with it. Unfortunately, there are no keys for it and you could only access it with dynamite. Still, it looks impressive and is a talking point. 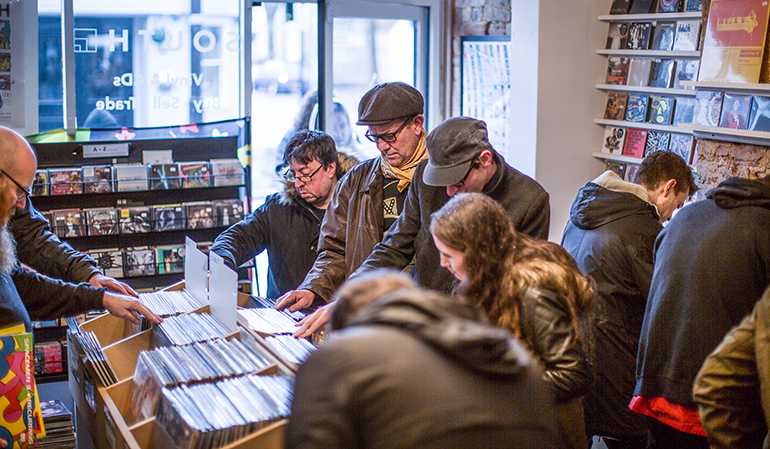 Richard always makes a big effort for Record Store Day and in 2015 he secured the services of locally based comedian and broadcaster Phil Jupitus to DJ in the shop. Phil has been a great supporter of record shops and had previously spent an Record Store Day working behind the counter at Spillers in Cardiff. Being in to music in south east Essex, we’re all a bit prone to jazz-funk. Gumba Fire, the new compilation on Soundway of South African bubblegum – the meeting point of American jazz-funk and soul with local music, such as Mbaqanga – is totally killer. Lo-fi in all the right ways, synths, drum machines, infectious energy, and amazing harmonies throughout. You can’t go wrong. A great companion to the Doing It In Lagos comp from a couple of years back. We’re big fans of Courtney Barnett, and all she turns her hand to, and are really excited for this new record. The EP collection was great, the debut album was great, her collaboration with Kurt Vile was great, hopefully this continues that trend. The lead-off single, which we were lucky enough to get on 7″ (which then sold out in a couple of hours) was killer, so expectations are high. I’m sure she won’t disappoint. This entry was posted in Featured Store and tagged independent record shop, south record shop.